Our work towards achieving our five key goals (see right) involves initiating, running and reporting on a host of projects across the Society via joint initiatives, working groups and committees. (Further details of how we’ve broken down the goals into smaller projects and prioritised them can be found on page 18 of our Strategic Plan). Responsibilities to drive these activities are currently allocated to the Secretariat and SISN’s Board, but ultimately many activities will be designated to an evolving portfolio of experts and ambassadors drawn from the Society’s diverse membership and beyond. We post such opportunities in the Get Involved section of this site and via our newsletter. The KI3 initiative aims to strengthen the availability, access and utilization of implementation knowledge to accelerate progress in scaling up implementation and impact on nutrition. KI3 was launched at the end of 2016 through a collaboration among the Scaling Up Nutrition (SUN) Movement Secretariat the International Food Policy Research Institute (IFPRI) and the SISN. The overall aim of this initiative is to strengthen the availability, access and utilization of implementation knowledge to accelerate progress in scaling up implementation and impact on nutrition. Establish a Network of Implementation Knowledge Providers: KI3 will convene discussions with the United Nations Network for Nutrition, the Civil Society Network (CSN), the SUN Business Network and the members of the Technical Assistance for Nutrition (TAN) project (MQSUN+, NI-TAN, ENN) to build on shared interests and priorities to strengthen the availability, access and utilization of implementation knowledge. Expand and Strengthen the Role of Civil Society Organization (CSO) and Alliances, and other actors at country level, in Technical Assistance (TA) and Knowledge Brokering (KB). Document and Share the Practical Realities and Good Practices of TA and KB, including the creation of an architecture for a SUN-specific toolbox to meet the identified challenges of SUN countries. Strengthen Implementation Research (IR). Stakeholders will be engaged to identify ways to strengthen the capacity, practice and funding for context-specific IR and other ways to engage the research and academic communities in SUN efforts (e.g., via TA and KB). The insights and progress emerging from these activities will be shared with the broader SUN movement through webinars in 2018/19, the FAO/IFPRI Global Event in Bangkok in November 2018 and the SUN Global Gathering in 2019. 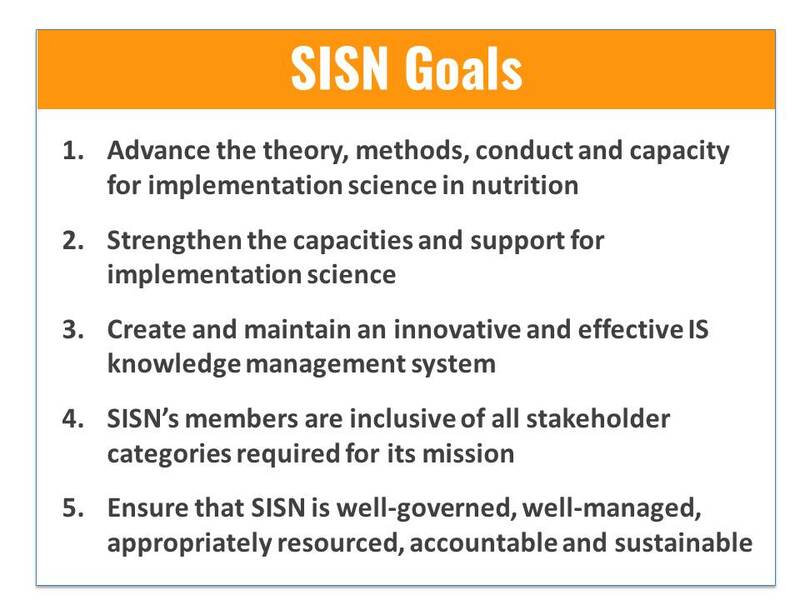 SISN Framework and Classification Scheme for Implementation Science (IS) in nutrition developed (with input from a broad range of experts including many Founding Members). New framework shared via SISN communication channels, seminars and symposia eliciting very positive responses. Minor amendments made to the framework and classification scheme in response to peer feedback. Paper on the new framework and classification submitted to peer review journal (publication to be confirmed). SISN has partnered with the International Initiative for Impact Evaluation (3ie) under a Bill & Melinda Gates Foundation (BMGF) grant to improve implementation and scaling-up of anemia control programs for women in Kenya and Uganda. b) when necessary, conducting practical implementation research (IR) in the form of rapid assessments, operations research, process evaluation or other exercises, as appropriate to address the critical challenges facing implementers and policymakers. Cultivate interest in IS/IR within the larger nutrition community in the country. Oversee the delivery of the communications activities with the development of relevant content for the Society’s communication channels. Newsletter and social media platforms launched and regular blogging commenced. SISN website relaunched – to provide a hub from which to disseminate information on all its activities. Large expansion of content. Communications support of Board activities at events e.g. symposia at MNF, ASN. Increased frequency (and followers) on social media. Establish the bases of a grant program to promote future ISN research in areas of interest to the Sackler Institute (e.g. nutrition in the lifecycle, obesity prevention, etc. Support the dissemination of implementation research findings through webinars, newsletter and other digital media, as well as conferences or other fora. To provide a platform for the creation, development and evaluation of membership engagement initiatives and activities to enhance the image and credibility of the Society. To review and sign off any membership related material in consultation with the appropriate Councilor. Application process agreed and set up on the website. Working Group convened and volunteers recruited from the member base. Decision made to develop a member survey to evaluate SISN’s value to members and if needs are being met. Final survey agreed (Survey to be disseminated to members Fall 2018). Member payment system added to the website. Collection of member dues commenced. Development of strategies and plans for member-only benefits for delivery in 2019. Contribute to advancing the theory, methods and conduct of implementation science (IS) in nutrition by strengthening the methods for implementation research (IR). To lead and cultivate the Society’s discussion and activities around the sound development and practice of methods of IS/IR in nutrition. To enable a place for members to share their knowledge, understanding and experience in methods and types of methods for IR in nutrition, by enquiring, learning and reporting and curating information collected through surveys, questionnaires and other means as appropriate. To enable a platform for the sharing and learning on methods used in IS and IR in nutrition among SISN’s members and to guide that process. To provide members with excellent resources, tools, knowledge on the methods for IR in nutrition, and further provide opportunities for engagement to strengthen methods for IR. To make the information on methods for IR available, usable and workable for purposes including but not limited to: reports, funding proposals, training, webinars, resource materials etc. To oversee the delivery of SISN’s methods-related activities. Methods Working Group established and volunteers recruited from the member base. Ideas for content of a SISN Methods Survey discussed in WG. Potential items and structure of the survey developed. Dr Gretel Pelto chairs SISN discussion group on Methods in IR at ASN. Draft of SISN Methods Survey finalized. Survey finalised and sent to member base, with invitation to complete it. Preparation of commissioned paper on methods in IR. Dissemination of commissioned methods paper. Ensuring full engagement with SISN members at all relevant stages of the process using all appropriate communications channels. The role of the finance committee is to provide financial oversight for SISN. Typical task areas include budgeting and financial planning, financial reporting, and the creation and monitoring of internal controls and accountability policies. In addition to developing an annual budget, the committee also sets long-term financial goals. N.B. This information will be periodically updated to keep you posted on our achievements and mark our progress towards our goals.